Futuras came out of showrooms fitted with Metzeler MEZ4s or Michelin Pilot Sports. Dunlop D207s were tried by Aprilia but rejected as they didn’t gel with the bike. On balance, it’s fair to say that the Futura is sensitive to tyres and can behave very differently according to what rubber is fitted. It’s important to get pressures right. Tyres have moved on since the Futura was launched, and Michelins (Pilot Road 2CT), Pirellis and Bridgestones (BT 021) would appear to be the favourites of most riders. Don’t mix tyres of different makes. The bike will definitely not behave. 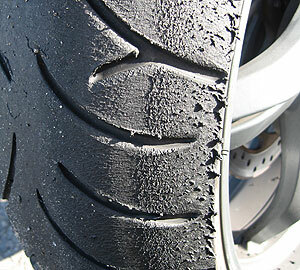 The topic of tyres crops up again and again on the Apriliaforum. Here’s a recent discussion. Apriliaforum: What tyres should I get? You could also see the tyres poll on the home page.